Today hubs had the day off work and we spent a leisurely few hours in our county town of Stafford. Our plan was to drink coffee, explore the town (where many years ago hubs was an art foundation student) and find a cosy, individual café for a restful lunch. We found this and more at Food 4 Thought - a training café providing support for people recovering from mental health problems to get into employment, voluntary work and college. We were given the warmest welcome and our Staffordshire oatcakes (mine were filled with brie and grapes) were delicious and great value. 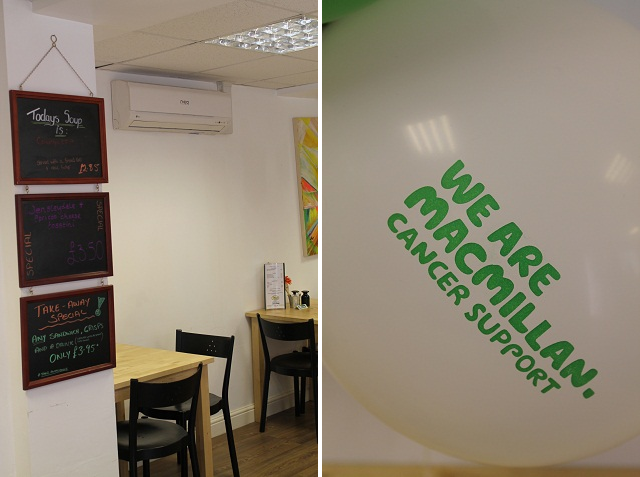 What's more the money from our pot of tea was taken separately to raise money for Macmillan coffee morning. Food 4 thought is part of the Time to Change programme (a programme set up to end discrimination faced by people who experience mental health problems). According to statistics one in four people will suffer mental health problems in any given year. Hopefully this programme, and projects like this café, will raise awareness that our mental health is just as fragile as our physical health. A restful lunch date that made a difference. I have worked in the Mental Health industry, and projects like this are a fantastic and holistic approach to people who have struggled with these issues. What a great place. So nice to give your money to somewhere so deserving. And to have something so delicious. Hope you have a good weekend. Raising awareness in a good way , all for it !